Most of the vitamin C you buy in the store is made with corn. This is a problem as almost all corn has now been genetically modified. Also, many Vitamin C brands contain ascorbic acid, which is not a natural substance and often causes stomach discomfort. Dr. Budwig, also discouraged the consumption of high doses of artificial Vitamin C and instead encouraged her patients to obtain it from a totally natural food source instead of in a pill form. Now you can do it like Grandma did and make your own natural and pure vitamin C basically free of charge! In the good old days before food supplements were so common, people found a clever way to make their own natural vitamin C using orange and lemon peels that are normally thrown into the garbage. Step 1 Wash the citrus fruit in hot water and gently scrub with a vegetable brush, to remove the wax coating. Organic citrus fruit doesn’t always have this wax coating. Step 2 Peel off the rind before eating or juicing your fruit. Try not to get too much of the white part of the rind because it’s bitter. Use a swivel vegetable peeler ( y-shaped ) for the task, results in thin parings of citrus rind with none of the bitter pith. Avoid using a knife, it is much harder to get the same results. Step 3 – Line a baking sheet with parchment paper and fill the sheet with the lemon or orange rinds. Don’t overlap them too much. Keep in mind that the peels contain live enzymes that will help your body digest and absorb all of the nutrients of the peels. Step 4 Now take the prepared citrus rind and lay skin side down, in a single layer on a baking tray. Leave the citrus rinds to air dry for a day or two until dry and crisp. Or bake in an oven at the lowest temperature until the rinds are dry are curled. Drying the citrus rinds can take anywhere between one and two hours, depending on how low the temperature of your oven can go. Aim for about 50C/122F setting or lower by propping the oven door open with a wooden spoon. Once the citrus rinds feel dry and crisp to the touch, they are done. Step 5 – Finely grind the dried rinds in a spice or coffee grinder or a Thermo Mix or VitaMix or with a mortar and pestle. As long as the powdered zest is completely dry, it should last for about a year. Store it in the refrigerator to prolong the shelf life. For a point of reference, one medium-sized orange makes slightly less than one tablespoon of powdered citrus zest. Add to marinades and dressings, infusing them with citrus flavours. 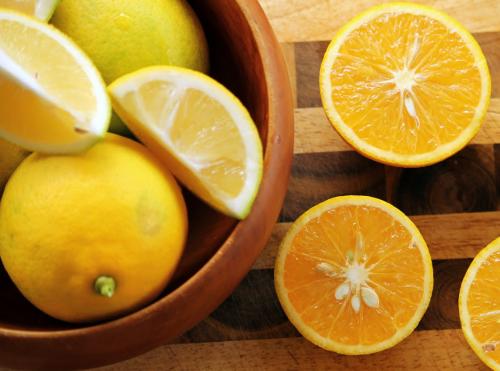 When you make a fruit salad, add some dried pieces of lemon and orange to marinate with the fruit for a few hours, removing them before serving. Add some zest to plain drinking water by adding some dried lemon, which gives a slight citrus taste. When roasting fish, meat, poultry or vegetables, throw in a few pieces of the dried citrus rind into the roasting pan to add a citrus note to the food…such as lemon with white fish, orange with salmon, lemon with lamb and chicken, orange with duck and orange with carrots and pumpkin. True you do not know who much Vitamin C you are actually consuming, but high doses are not needed nor encouraged under the BUDWIG food plan. One rounded teaspoon will supply you with more organic vitamin C complex, rutin, hesperidin, and bioflavonoids than your body will need for the day, regardless of your size. And this home-made citrus peel powder mixed in your blender with some fresh organic apple juice tastes great too.